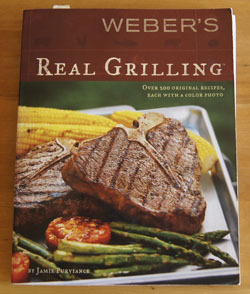 Cookbook #169: Weber’s Real Grilling, Jamie Purviance, Sunset and Weber books, Weber-Stephen Products Co., 2005. Ages ago we had a covered Weber charcoal grill, then changed to a gas grill at some point in time. Today I consider a gas grill an essential component of my cooking equipment, summer, fall, winter, and spring! I got Weber’s Real Grilling about six years ago, when we purchased our current Weber gas grill. I use this book a lot! It sort of flops open to “Basic Baby Back Ribs”, where I have several post-its pressed into place. I highly recommend this cookbook. It taught me how to cook over direct and indirect heat on a gas grill, and how to set the temperature of the grill. If I want to know about rubs, or BBQ sauces, I go to this book first. If I want to know how long to cook a cut of meat, poultry, or fish, I go to this book first. The recipe chapters are: red meat, pork, poultry, fish, veggies and sides, and desserts. Each recipe has an accompanying photo that makes this amateur photographer envious! The recipes offer a variety of seasonings: Rib-Eye Steaks with Tomato Harissa, Flatiron Steaks with Little Italy Relish, Sweet Chili-Mustard Chicken Salad with Toasted Almonds, Smoked Pulled Pork in Hot Chile Sauce, and Soft Tacos with Halibut, Guacamole, and South American Slaw are some examples. A fun range of ingredients and lots of fresh herbs and vegetables – I can always find a recipe to try in this book! In September 2013 we were “stranded” at our home northwest of Lyons by a 500-year flood. Rushing water covered our only drivable way to civilization. Our power was out for a week in our all-electric home. We had no landline service. No cell phone reception. I am a packrat, so we had plenty of food, but how to cook? The Weber grill! That’s when I pulled out Weber’s Real Grilling and learned how to grill pizzas. They were wonderful! 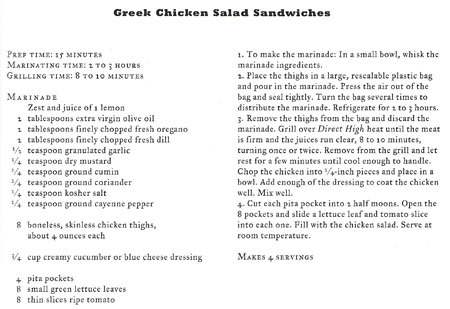 For this blog I choose to make “Greek Chicken Salad Sandwiches”. I like the seasoning mix for the marinade, and I like using chicken thighs sometimes instead of chicken breasts. Ever since our trip to Turkey, I’ve especially enjoyed Mediterranean-style food. 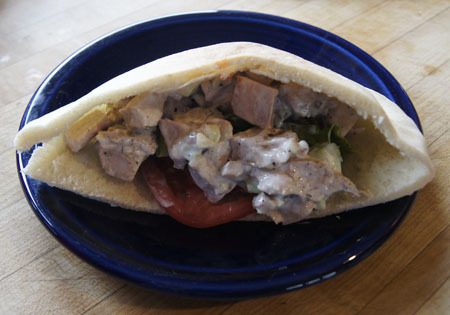 Plus: pitas! It’s been ages since I’ve bought (or made) pita bread. For the “creamy cucumber or blue cheese dressing”, I will substitute a cucumber dressing that I have in my own cooking documents. Whisk together the marinade ingredients (lemon though the spices). 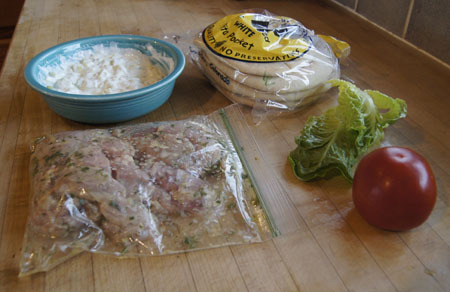 Place the chicken thighs in a plastic bag and pour in the marinade. Close the bag and refrigerate 2-3 hours. Combine the cucumber dressing ingredients and set aside. Remove the thighs from the bag and discard the marinade. Grill over direct high heat until the meat is firm, 8-10 minutes, turning once or twice. Remove from the grill, and when cool enough to handle, chop the chicken into small pieces. Combine with enough of the dressing to coat the chicken and mix well. Cut the pita breads in half. Open each half and fill with the chicken mixture, lettuce, and tomatoes and serve. We both enjoyed these! The chicken in nicely seasoned and well complimented by the cucumber dressing. We had them for dinner on a hot summer day, but they’d be good for lunch too. I’ve made chicken salad for sandwiches before, zillions of times. Usually I use boiled chicken. Marinating and grilling the chicken – for chicken salad? A great idea. Putting the salad in pita bread? Another great idea. Next time, I’ll probably cook the chicken ahead of time, since they are served at room temperature. This entry was posted in 250 Cookbooks, Main Dishes, Sandwiches by admin. Bookmark the permalink.